One of the most enduring themes in tamil movies a while back used to be romance between a rich man and a poor woman (or the other way around), that was opposed by the parents. Naan Adimai Illai is another unremarkable entry in this category. The only noticeable aspect of the movie is its cast. Starring alongside Rajnikanth is Sridevi, who had already found success in Hindi movies and was fast on her way to becoming the numero uno in Bollywood. As it turned out, this ended up being her last movie in Tamil but sadly, it is a less-than-stellar swan song for the talented actress. Priya(Sridevi) is the daughter of Rajasekhar(Girish Karnad), a rich industrialist. 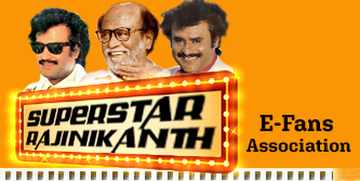 She falls in love with Vijay(Rajnikanth), a photographer, after he rescues her from some rowdies. Going against her parents, she runs away with Vijay and they get married. The differences in their status and the attitude of Priya's parents leads to some friction between the couple and finally, a small fight blows out of proportion and ends up with Priya returning to her parents' house. There she gives birth to a son and is all ready to mend fences with Vijay. But her father's machinations prevent this. He lulls Priya into believing that her child was still-born while Vijay raises the kid. Like Alaipayuthey, Naan Adimai Illai too doesn't stop with the lovers overcoming all opposition to unite and proceeds to focus on their life after they marry too. Unlike Manirathnam's movie, the romance here is a small portion of the film and the little that there is, is handled unimaginatively and in a rushed fashion. Both Rajni rescuing Sridevi from the rowdies and Sridevi falling for him are cinematic and we never connect with them as lovers. Its not only in the romance department that the director seems wishy-washy. Rajni's meetings with Girish Karnad too lack fire with the writing seeming a little tame. As always, the director overdoes things by presenting the standard caricature of a ladies club-frequenting woman as Sridevi's mother. On the other hand, Girish Karnad's character earns respect during these portions (like the talk he has with Sridevi during breakfast). But strangely, the roles are reversed as the movie proceeds. The mother's attitude towards Rajnikanth and Sridevi seems more natural while Girish Karnad's actions become increasingly illogical and unbelievable. It is debatable if any man, however money-obsessed he may be, will act the way Girish Karnad does, towards his own grandson. The arrival of the couple's son definitely improves the movie. The kid's questions about his mom are not overdone and he too doesn't overact and turn irritating. The climax too is executed well inspite of the foregone conclusion. The reactions of Rajni and Sridevi as they spontaneously display happiness at each other's arrival and then pull themselves back after a moment is very natural. I have no idea why the director chose to have Vijayakumar's character since it does nothing to the story. While it is obvious that Sridevi will not fall for him, making him a man who has just been released from jail is also unnecessary. And to make things worse, everyone, including Girish Karnad, believes that he has just returned from a foreign land. As was the case with Vinu Chakravarthy in Mappillai, his dialect and behavior make it clear where he is from and just makes the people believing his story seem like fools. The character takes another beating when he tries to kill an infant. Rajni seems distinctly uncomfortable in the predominantly romantic role and not much chemistry is evident between him and Sridevi. He has applied a whole lot of makeup that gives his face an unnatural color. Sridevi looks nice and performs well. Considering Girish Karnad's similar role as the strict father in Kaadhal Mannan, one could say that his debut here typecast him. Vijay Anand has some good tunes of which Oru Jeevan Dhaan... is the best. But he turns out to be S.A.Rajkumar's guru in using different versions of the same tune in every possible situation.